Egypt’s Coptic Christians are heirs to one of the very earliest and most creative traditions of the faith. Christianity’s roots in Egypt date to the first century, and for centuries afterwards Egypt was distinguished for its flourishing achievements in Christian literature, art, architecture and spirituality. In its time, the Coptic language was one of the most significant vehicles for Christian thought and debate. 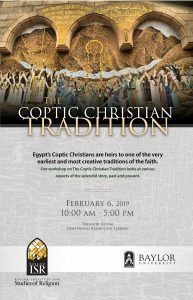 Our workshop on The Coptic Christian Tradition looks at various aspects of the splendid story, past and present.